BookScan - Iteam Resources Inc. The BookScan Station Document Center is a high-volume, high-speed, easy-to-use, self-service scanning kiosk for books and documents. 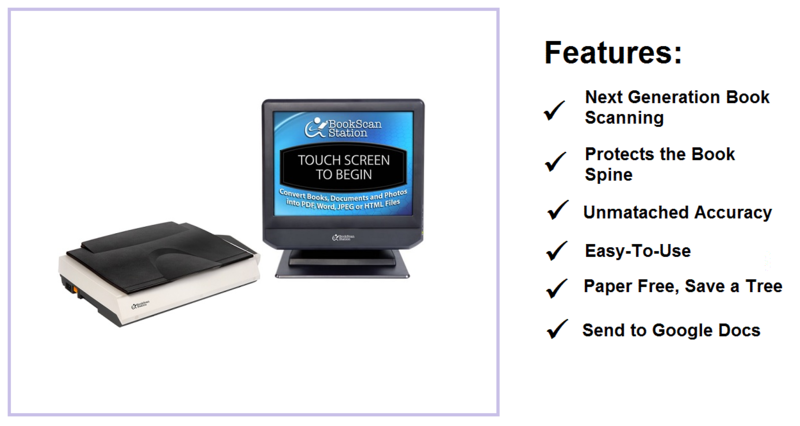 Performing at more than 200% faster than the industry standard BookScan Station, the BookScan Station Document Center includes the BookScan Station 17” touch screen computer with 3.3GHz 3rd Gen Core-i3 Intel processor; the FB6280E high-speed, energy-saving, LED-based book-edge scanner; the iVina BulletScan S400 color duplex sheet fed scanner rated at up to 40 images per minute with double-page feed detection; a 3 Track Magnetic Stripe Card Reader for identifying and authenticating authorized users; ABBYY Fine Reader Technology for unmatched optical character recognition accuracy; and the industry standard BookScan Station software that guides the user through the scanning process. The BookScan Station Document Center is designed for high-volume, high-traffic areas where productivity and image quality are paramount. The state-of-the-art, LED-based, energy-saving, Book-Edge scanner scans an 11” x 17” page in under 5 seconds in black and white at 200dpi. The Intel 3.3GHz Core-i3 processor converts the scanned page into a searchable PDF file format in less than 4 seconds. Stack up to 50-pages into the iVina BulletScan S400’s automatic document feeder and watch it outpace digital copiers in color as well as black and white. Over 100 public and university libraries in the last year have chosen the BookScan Station for its easy-to-use, yet powerful features. Now libraries can replace their toner-based copiers with the environmentally-friendly BookScan Station Document Center. The BookScan Station’s patented scanner design allows the book page to lie flat on the glass, thus capturing the full image of the page without distortion. The design also protects the spine of the book from damage, thus extending the book’s life. The BookScan Station can automatically auto-crop, auto-straighten and auto-orient each page scanned. The BookScan Station is integrated with the ABBYY Fine Reader Engine for unmatched Optical Character Recognition accuracy. The Fine Reader Technology takes the scanned images of the books or documents and makes them machine readable in several common formats, including PDF and Word. ABBYY’s multilingual document recognition engine automatically detects English, French, Italian, German, and Spanish languages. 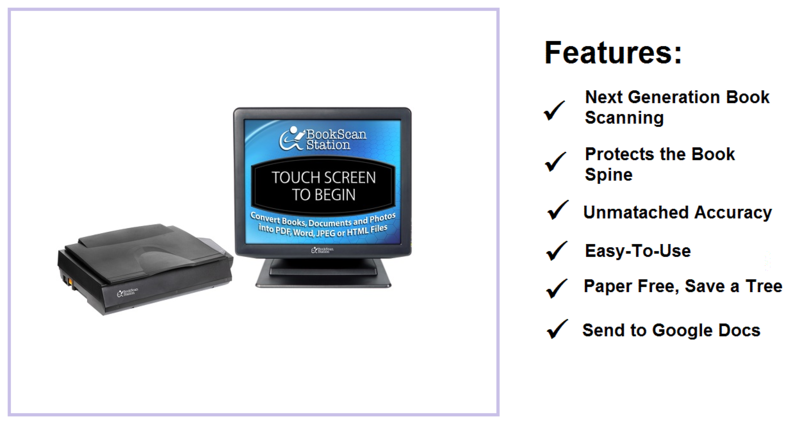 Designed to be easy to use with large friendly buttons, the BookScan Station touch screen guides the user through the scan process including choosing the file formats, scan quality, color depth, file naming, and destinations. Scan books and documents into PDF, text-searchable PDF, JPEG, and Word file formats by simply touching the screen for the preferred file format. Searchable PDF files allow you to search for any word in the PDF file or copy text out. Word files may be opened and edited in any Word compatible text editor.